Like most residents of Manhattan, Reggie knows his way around town and has learned the most efficient ways of getting to where he wants to go when he is out and about in the city. Some of what he has mastered is merely common sense, but some of it is unique to living in New York City. 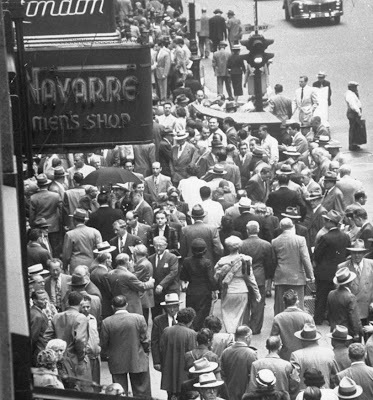 He is often surprised, and frequently exasperated, when he is confronted with people bumbling about town who are either not familiar with the basic rules for navigating one's way around the city or who choose to ignore them. Today's essay is the first in a series I will be posting of Reggie's Rules For Navigating One's Way Around Manhattan Like a New Yorker. My subject today is what I consider to be the rules for successfully navigating the sidewalks and streets of the city on foot, as a pedestrian. I plan on following it with additional posts of Reggie's Rules for using taxis and public transportation in the city, when passing through doorways, and other miscellanea relevant to the subject. New York is a city of walkers. We use the sidewalks as our highways and our shoes as a form of transportation. 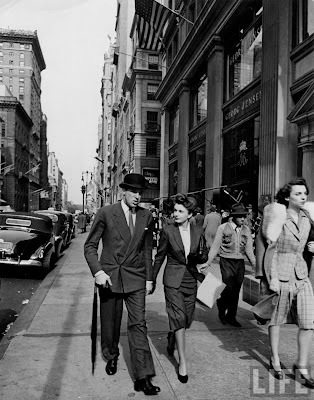 Walking is the most efficient and fastest way to get around many parts of Manhattan during the day, particularly Midtown, and it is a pleasant way to travel greater distances as well, at least when one has the time for it. Furthermore, walking is good exercise, especially for those of us who spend much of our days sitting at desks high up in the city's office towers. 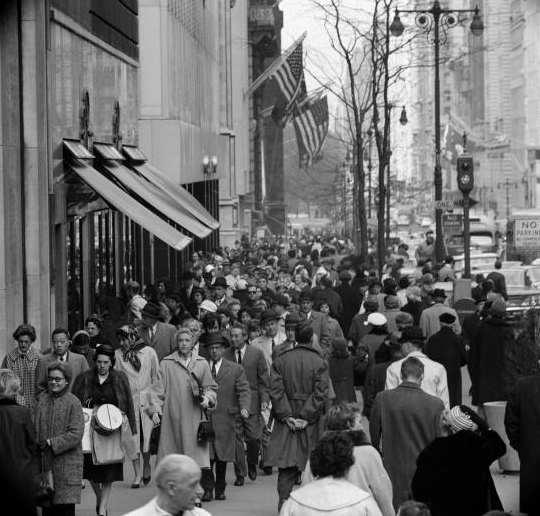 New Yorkers use the city's sidewalks to actually go places. 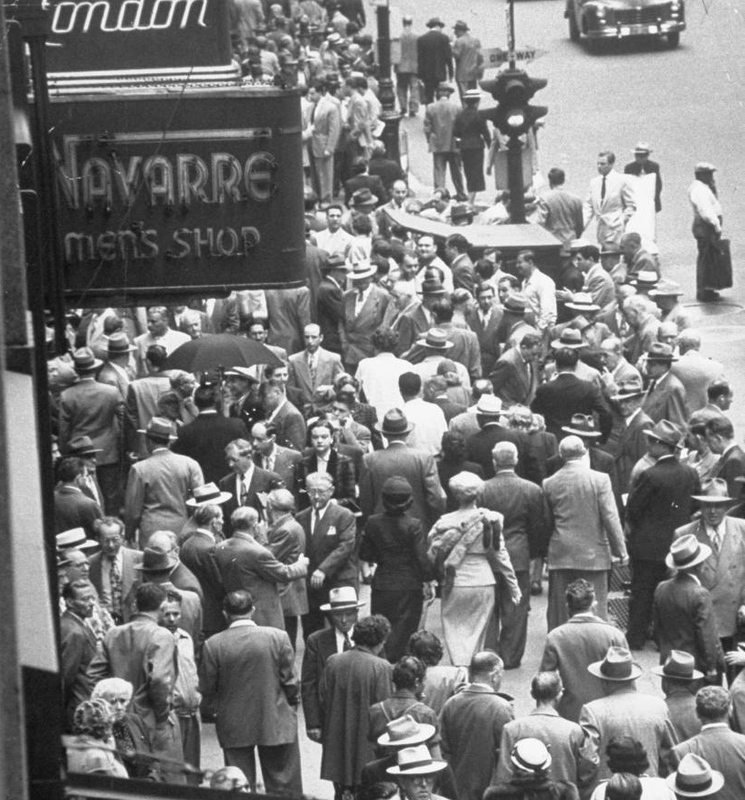 When walking on busy sidewalks in Manhattan, either pick up the pace and walk like a New Yorker, or move to the side and let the city's on-the-go inhabitants pass you by, unimpeded by what they consider to be your dawdling. This rule applies to everyone, including those slowpokes who live in New York and visitors from elsewhere who aren't accustomed to walking around in a busy city. It clogs up the sidewalk and annoys the people who are trying to get around you and go somewhere. 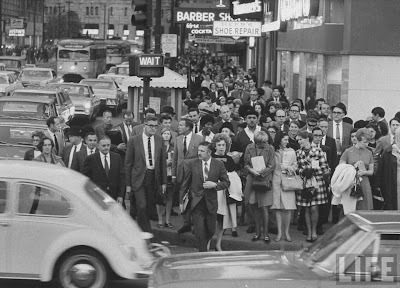 Be mindful of the other pedestrians who have places to go and a deadline for getting there. This is a particular problem in Midtown on Fifth Avenue on the blocks between the Trump Tower and the Apple store at the GM Building, where the sidewalks are clogged during daylight hours with out-of-towners gawking and milling about. Stay to the right when walking on sidewalks—the traffic moves faster and more smoothly that way. If you do, do not then give the driver who honks at you while swerving to avoid hitting you a dirty look, or the finger, or shout obscenities at them. It is okay for you to object to aggressive or thoughtless behavior from a driver when you have the right of way and they do not, but it is not acceptable for you to do so when you are the one who is ignoring the traffic light. New York is full of people who blithely jaywalk across traffic-filled streets mid-block, dodging cars with seemingly nary a care in the world. Although Reggie considers jaywalking to be acceptable when the streets aren't busy, he does not recommend it when they are full of moving automobiles that could potentially mow you down. Furthermore, he believes that you should never defiantly (or stupidly) jaywalk across a busy street with your back turned to the approaching traffic, as he sometimes is astonished to see idiots pedestrians doing from time to time. If you do so you are sorely tempting fate. You cannot count on the fact that the driver will see you, or will even care if he doesn't. You are not immortal. That is, unless you don't care if your knee joints are crushed by the moving car when it accidentally pins you to the stationary one. I know this seems like a highly obvious, common-sense rule, but you'd be surprised how many times Reggie has witnessed some numbskull pedestrian who is oblivious to it. Your mother was right on that one. Have some manners, please. Only use regulation-sized umbrellas when walking on a crowded New York sidewalk in the rain. It is piggy and thoughtless to use a huge golf umbrella, and possibly dangerous to the people around you who have to duck to get out of its way. Even born-and-bred New Yorkers get lost in Greenwich Village! They are an important part of the city's economy and should be welcomed by its citizens. Consider it to be your good deed of the day. And there you have it—Reggie's Rules for walking around Manhattan like a New Yorker. Follow them, and you will be assured of cruising along the city's sidewalks and crossing its streets with ease, and pleased with your agility and facility in doing so. That is, until you bump headlong into some dunderhead who either isn't aware of such rules or who thinks they are above such things. If that happens, and after you say "excuse me" to them (even though they should be the one begging your forgiveness), please direct them over here to Reggie, who will be more than happy to straighten them out in these matters. In February, when I posted my essay Consider the Saucer, I promised that I would publish photographs from time to time of some of the prettier antique saucers we have collected. 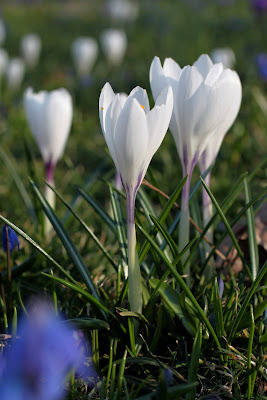 Today is the first of such posts. I plan on making this a once-a-week series until I either run out of saucers to feature or I run out of patience. 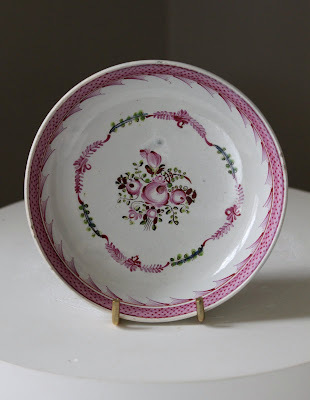 This week's saucer is an early English pearlware one, circa 1790-1800. It is finely painted in a Famille Rose style decoration reminiscent of Chinese export porcelain. It measures 5 ½ inches in diameter and came with a matching tea bowl. It is unmarked. Boy found the cup and saucer at Todd Alexander Romano's shop, when it was still at Lexington Avenue and 73rd Street. I like this saucer because it is pretty and floral and summery, and I enjoy seeing it when we place it on one of the tables in our drawing room at Darlington House, where it has recently returned now that spring has arrived in the Hudson River Valley. I have something that I would like to share with you, Dear Reader, that I think you will enjoy. It is a book that was recently given to me, and which now sits firmly ensconced in the pantheon of my entertaining library at Darlington House. 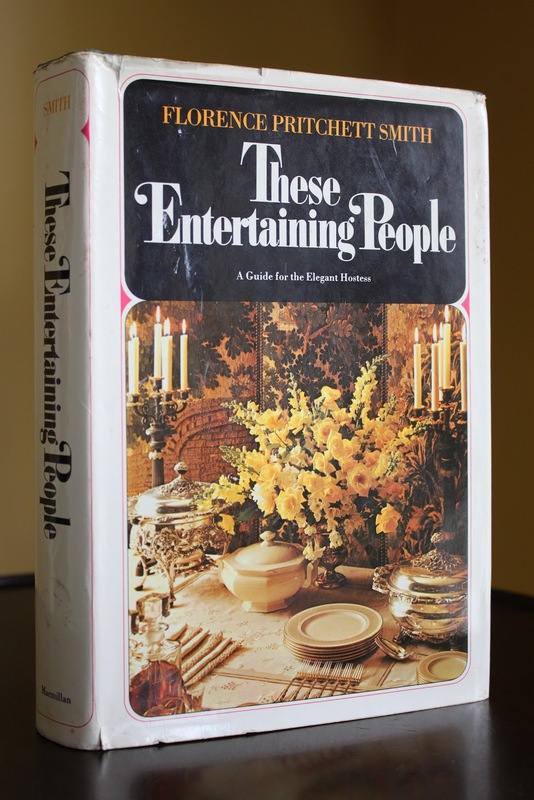 Called These Entertaining People: A Guide for the Elegant Hostess, it was written by Florence Pritchett Smith, also known as Mrs. Earl E. T. Smith, and was published by Macmillan in 1965. It is a delightful, information-packed guide to entertaining and to life exquisitely lived along the New York/Southampton/Palm Beach axis back when people still dressed for dinner and when society columns still appeared in newspapers. In other words, before all Hell broke loose. My dear friend Bitsy Adams gave it to me when she came to stay with us at Darlington House several weeks ago. Bitsy arrived with the book perfectly and beautifully wrapped, and she was quite pleased to make a present of it to me, as she was confident that I would appreciate it. And Bitsy was correct. But I didn't just appreciate it—I loved it! And I think you will, too. Florence Pritchett Smith, the book's author, was quite the lady: a former model, society gal about town, radio and television personality, columnist, wife to America's Ambassador to Cuba during that country's revolution, onetime JFK girlfriend, and partygoer and giver extraordinaire. 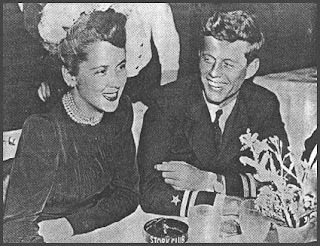 According to some of the accounts I read while researching this essay, Mrs. Smith and President Kennedy remained more than "just friends" long after each had married others, a dalliance eased at times by the convenience of having adjoining houses in Palm Beach, a town known for knowing how to have fun. But it is not for the Kennedy connection that I find this book interesting or recommend it to you, Dear Reader. No, it is for the merits of the book on its own. These Entertaining People is a delightfully chatty read and is chock-a-block with the author's excellent advice, observations, and helpful tips for throwing successful parties, from intimate informal luncheons to large black-tie dinner dances. 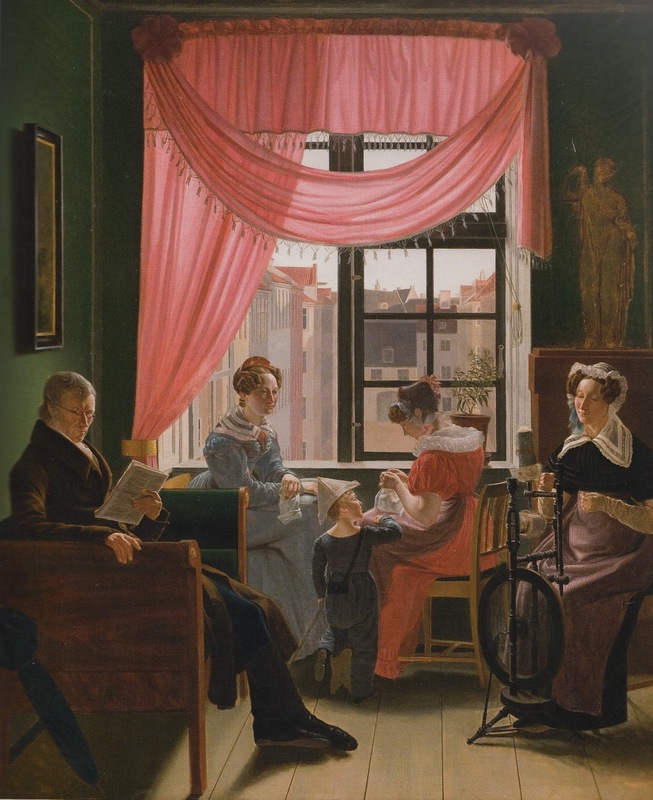 The book also includes anecdotes about and recipes from a heady list of American and European society figures, fashionable decorators, and media personalities of the day. Although some of what Mrs. Smith writes in her book seems somewhat quaint in today's post-women's liberation world, most of what she has to say still resonates when it comes to the subject of being a thoughtful, generous, and caring host (or hostess). One can learn a great deal from Mrs. Smith, and not just about entertaining at the most elite level, either, but also on a more accessible one for today's readers, too. She writes with authority and clearly knows her subject intimately and thoroughly. But she is not just a self-appointed arbiter of such matters: the editors at Life Magazine considered her to have hosted one of the top 100 most-memorable parties of the twentieth century, the Cuban Fiesta Ball she threw at the Waldorf-Astoria in 1958, during her husband's ambassadorship. For those of my readers who are interested in entertaining and living the good life, Reggie highly recommends that you find yourself a copy of Mrs. Smith's book, read it cover to cover, and take it to heart. Not only is it full of excellent suggestions and good ideas and tips, it is well written and often amusing, too. The author comes across as a delightful and engaging person, full of common sense and fun, and someone that Reggie would have been delighted to know and count as his friend. 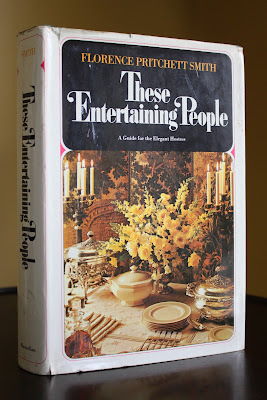 Tell me, do you have a favorite vintage entertaining book in your library? 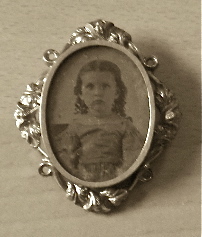 Continuing my series on miniatures, today I am posting about a recent addition to my collection. 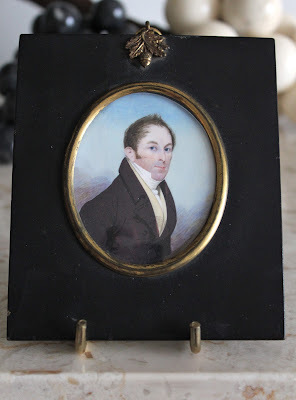 It is a miniature portrait of an Englishman, painted on ivory. Based on the sitter's clothing and the frame, which I believe is original, I date it to the first quarter of the nineteenth century. The subject of the portrait is identified on the reverse as a "Mr. Travers," but that is all I know of him. It is unsigned. 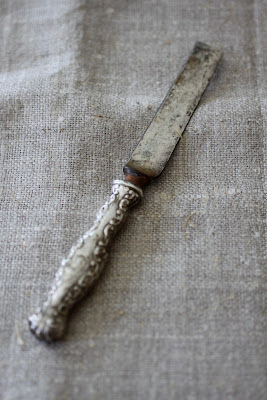 I found it in an antiques shop owned by a family of pickers in the town near Darlington. We've had good luck with these dealers before, as they were the source of the painting of Robert Burns that I posted about last year, among other things that we now own. I was attracted to the miniature of Mr. Travers because I thought it was exceedingly well painted. I also liked the fact that the sitter is posed in an attenuated, three-quarter pose, and he is staring at us with deep blue eyes and with what appears to be an intelligent and clever expression. His features are refined. I encourage you, Dear Reader, to double click on the image to get a better view of how well he is painted. I particularly like the artist's handling of Mr. Travers' stylishly tousled hair and rakish sideburns, so favored in the Regency. He is dressed fashionably in the severe style favored by Beau Brummel. The painting is framed in a black papier-mâché frame similar to the one on the miniature portrait of the China Trade merchant that I posted about in February, when I inaugurated this series. For now I am displaying my miniature portrait of Mr. Travers on a simple easel on my bedroom chest of drawers at Darlington House, where I am pleased to see him watching me as I go about my daily routines. Next: Is She Really Who and What She Is Purported To Be? What Is One To Do When One Is the Recipient of Family Silver? A month or two ago my dear sister Camilla telephoned me and offered to send me a set of silver flatware that she had inherited from our mother, MD. 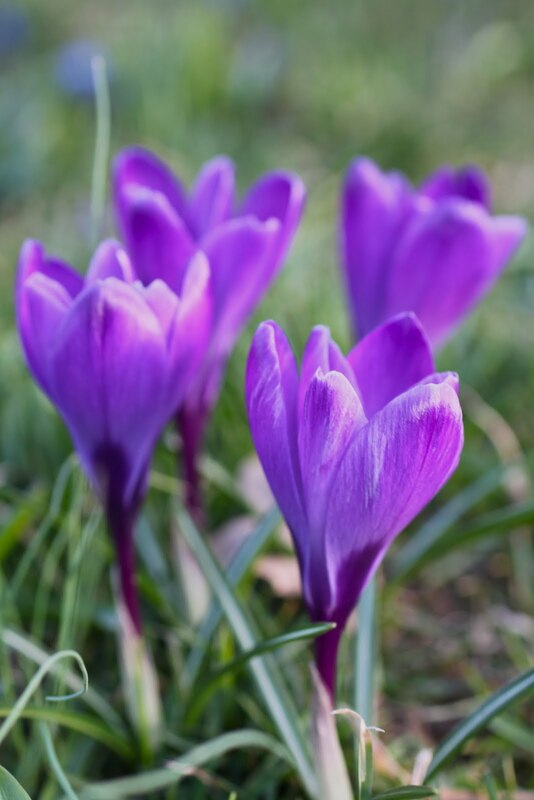 It had originally been bought at the end of the nineteenth century for a great-great aunt of ours, named Rita, who married for the second time later in life and left it to her sister, our maternal great-grandmother, known as "Giggy." When Giggy's widower husband, my great-grandfather, who was known as "Unky" and whose photograph was the subject of an earlier post of mine, died in his nineties in the mid 1950s, MD inherited several houses full-to-bursting of furnishings from him including, among other things, his former sister-in-law's silver flatware. MD was the only heir to her mother's parents (she, like her mother before her, was an only child), and she was overwhelmed by the vast quantity of stuff that came into her possession when she inherited their estate. 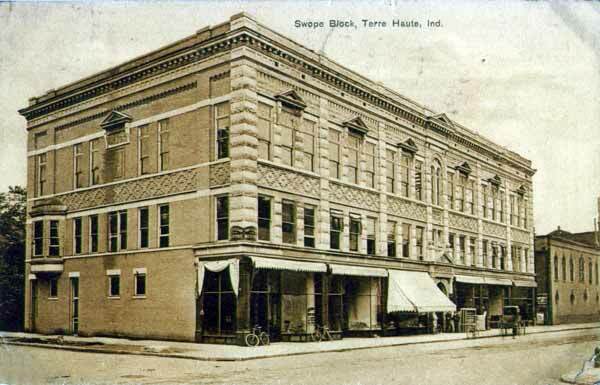 She sold most of it in a two-day sale held at an auction house in Indianapolis, the nearest large city to where her grandparents had lived. 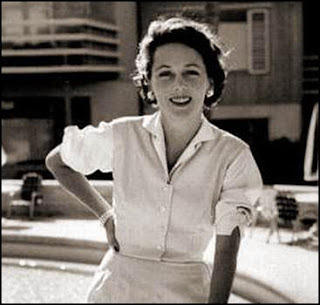 Not only was what she inherited from them out of fashion at the time, but she considered most of it to be far too formal for the way she wanted to raise her (then) young family. 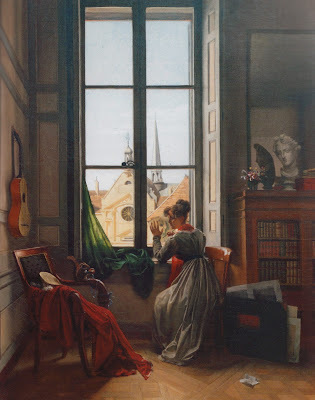 Even so, she still shipped home a truckload of furniture and objects, mostly Victoriana, that she scattered about the houses we lived in when I was growing up. 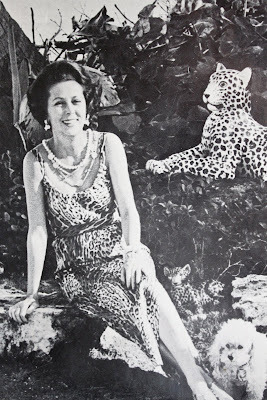 She got rid of most of it, though, in the late 1960s and early 1970s when she replaced it with modern Scandinavian furniture that was then much in vogue. Today only a handful of pieces of furniture and objects from her side of the family remain in family hands. 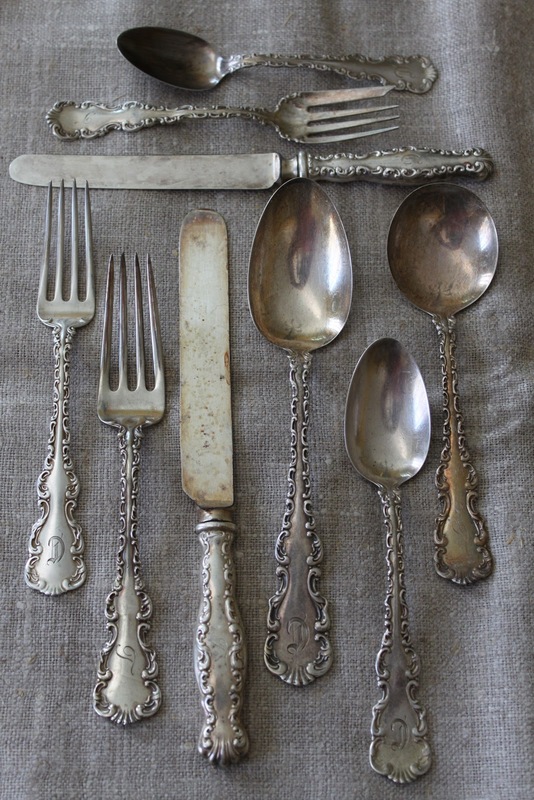 MD held on to some of her family's silver, including her great aunt's flatware and two other substantial sets of silver that had once belonged to other relatives. Our family regularly used that silver when I was growing up, including eating all of our meals using the flatware that MD inherited, plus other silver that came from my father's side of the family, mainly nineteenth-century coin silver. Most of the silver is monogrammed "C"
As I have written in an earlier post, MD was rather a snob when it came to certain things (despite vehement protestations by her to the contrary), and she informed her children that it was "common" to use anything other than sterling silver flatware for "everyday" purposes (interestingly, she considered stainless steel to be preferable to silver plate, which was beneath contempt). "People like us," MD sniffed, had multiple sets of sterling flatware at our disposal to choose from when setting the table, so why use anything else? It's just silver, after all. Not surprisingly, our silver got rather careless treatment. MD thought nothing of putting it in the dishwasher, where many of the pitch-filled knife handles split open in the heat. Numerous spoons and forks got mangled over the years by kitchen sink dispose-alls, were thrown out with the trash, or were otherwise lost. 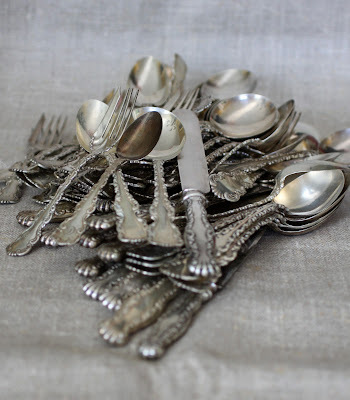 MD spent the last decade and a half of her life living in a life-care/retirement facility where she had little use for her silverware, so she packed it up and put it in storage. 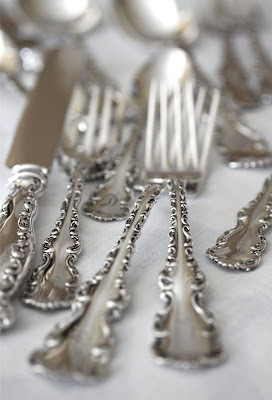 When it came time for me and my siblings to divide MD's belongings after she died, what had once been three large intact sets of silver flatware were now missing quite a few pieces, and much of what remained was scratched, dented, and heavily tarnished after years of not being used. So, what does one do when one inherits—as Reggie did from his mother—or is given—as Reggie was by his sister Camilla—silver that shows evidence of both wear over the generations and where some pieces or elements are missing, broken, or damaged? griffon with its right paw resting on a circle containing a "W"
If one is a conscientious steward of such things for future generations, as Reggie is, one takes the silver to a silversmith and has it polished and repaired where needed, and one fills in the missing pieces where one can. Fortunately, there are several silversmiths here in New York City that specialize in restoring and repairing silver and that—in some cases—also stock pieces in long-discontinued silver patterns that one can buy to fill out one's flatware sets. In addition to these sources there are internet-based specialist silver dealers, such as Replacements, Ltd., that carry stock of odd pieces of silver in discontinued patterns that one can buy. When I examined the silver that Camilla sent me I determined that it needed only modest attending to in order to return it to a gleaming, well-cared-for state. I took it to Raphael Silver & Antiques in New York City for polishing and repairs. In the past I have also used Jean's Silversmiths, which is coincidentally next door to the building where Raphael's workrooms are located, but I chose to use Raphael for this job because they had recently done some excellent work for me in repairing and polishing some silver, including several pieces that I bought last fall at auction and which I wrote about in an earlier post. 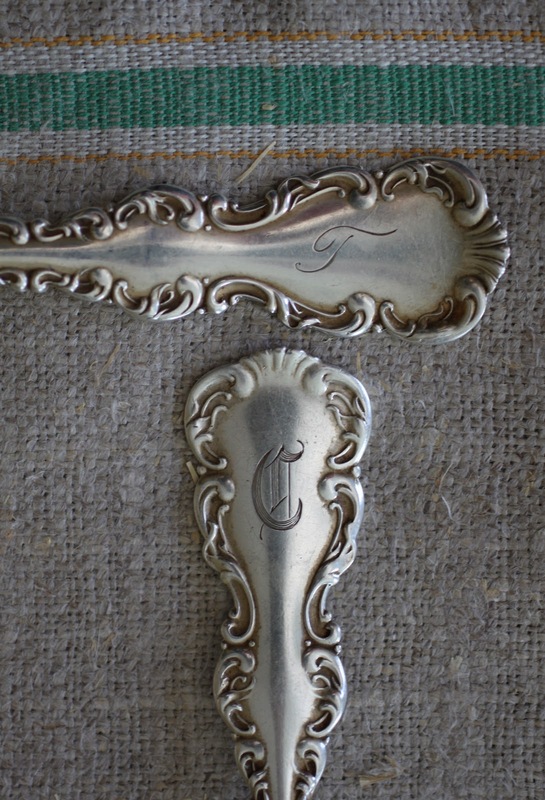 Raphael did a superb job in polishing and restoring my great-great aunt Rita's silver, and I highly recommend that you consider entrusting your silver to them for restoration, should it need it. I also recommend Jean's Silversmith, too, for repairs and polishing, and when seeking replacement pieces, as they have a far more extensive inventory of repacement silver flatware and hollowware to choose from than Raphael does. Both do a substantial mail-order business. Reggie believes that it is important to take care of one's possessions, including those we inherit from our forebears. In the case of silver, that means having it polished and repaired where needed, and then storing it safely when not in use. But Reggie also believes that one needn't be held hostage by inherited things, and that if one isn't inclined to use them or doesn't care for them, one should feel free to either pass them on (as Camilla did to Reggie) or sell them (as MD did years ago). However, so long as we own it Reggie believes we are responsible for maintaining it. That's why they call it stewardship. Please note, Reggie had received nothing in return for his recommendations, nor does he expect to. 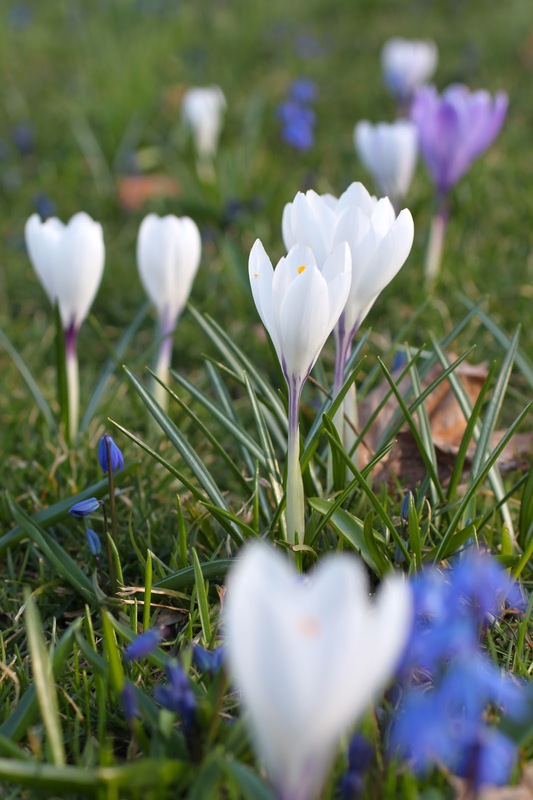 Call me old-fashioned, but I adore crocuses. The older the variety the better, as far as I'm concerned. I love it when crocuses are irregularly scattered about lawns, more so than when they are planted in rows or in beds. It looks quite natural and, unexpectedly, just right. It is such a pleasure when they peep their pretty heads up out of the grass, like so many chicks in a nest, their mouths open, waiting for sustenance. I'm most partial to white and purple ones, which is—not surprisingly—all that we have at Darlington. Ours range from purple-throated white to the palest of lavenders to the darkest of ecclesiastical purples. 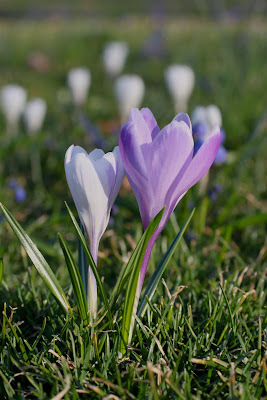 The crocuses were at their peak this weekend in our part of the Hudson River Valley. What a joy it was. The other evening Reggie and Boy had what I consider to be the type of New York evening that I fantasized about having one day, back when I was a young and callow lad, before I moved to this glittering city more than thirty years ago. It included a generous mix of cocktails, a gallery opening at the city's most magnificent museum, dining in an impossibly smart restaurant, and meeting new, interesting, and noteworthy people. And it all took place in the most beautiful and fashionable part of the Upper East Side of Manhattan. Reggie was livin' the dream that night. Well, at least his dream at this stage of his life . . . Okay, Hipsters, you can have your Meat Packing Districts, your Nolitas, your Chelseas, and your Williamsburgs. Reggie truffled his way through those gritty parts of town when he was younger, too. Now he is quite happy to be a boring, middle-aged investment banker living and frollicking in what you might consider to be the stuffy and dull old UES. And he's quite happy if you should feel that way, too, since that means there's more room for him and his kind right where he wants to be. Our evening began with attending an opening cocktail party for a new exhibition at the Metropolitan Museum of Art, where we were the fortunate guests of one of the museum's curators. It was for Rooms With a View: The Open Window in the 19th Century, a charming show of early nineteenth-century European paintings and drawings of interiors with views through windows. 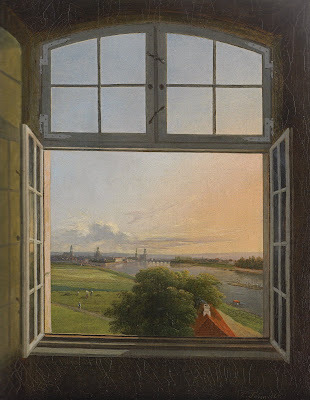 Most were painted by German, Scandinavian, and Baltic artists during the neo-classical and Biedermeier periods, and many are on loan from museums and collections in central Europe. 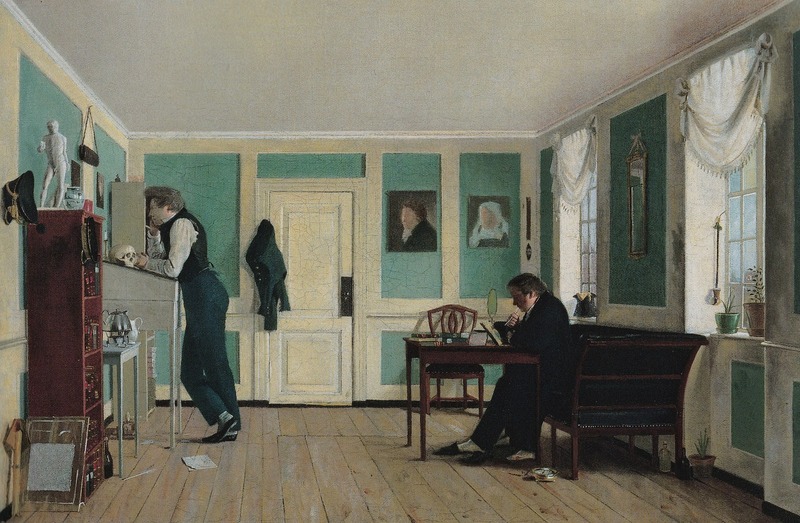 The paintings are intimately scaled and precisely and skillfully executed, and quite lovely to look at. 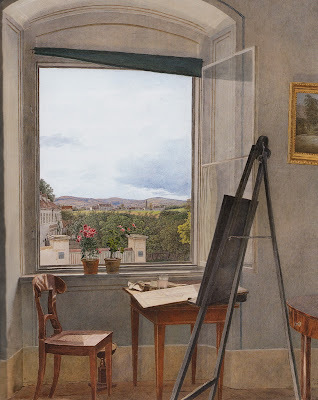 They are a fascinating record of interiors and furnishings of early nineteenth-century continental Europe, including many of the artists' own studios or homes, and are well worth studying at length. This is not a show that one should breeze through—it merits close and careful observation. I plan on returning to see it again soon. 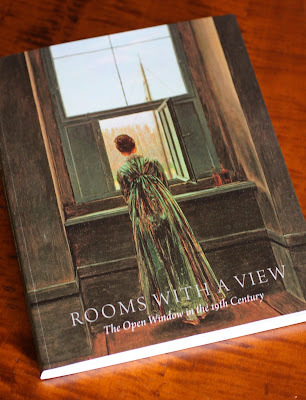 I have already spent several hours reading its well-written, highly informative, and profusely illustrated catalogue so that I will be better informed when I return to see the paintings again. The curator of the show, Sabine Rewald of the Metropolitan, did a superb job. I highly recommend that you make plans to see the show, Dear Reader, as it is a not-to-be-missed, absolute gem. Afterwards, in need of more sustenance than visual stimulation, vodka, and cheese balls, we headed over to Swifty's, where Robert Caravaggi was kind enough to give us a table on the spur of the moment and without a reservation. The place was packed! As one often does at Swifty's, during dinner we fell into a pleasant conversation with a couple sitting at the next table to ours (the tables are very close together at the restaurant, so one is rather cheek-to-jowel with one's neighbors). They were quite jolly and chatty, and we had a delightful time speaking with them. Looking around the room, I noticed that David Patrick Columbia of New York Social Diary was also there, so I stopped by his table and said hello to him and his guest. On our way out we passed James Andrew of What Is James Wearing?, whose blog I am a regular reader of and who is a sometime commenter on mine. We stopped and introduced ourselves to him and his dining companion, and they couldn't have been nicer. And to top it off, the next morning we were invited to a cocktail party by the couple we sat next to at dinner at Swifty's, and with whom we exchanged contact information at the end of the evening. 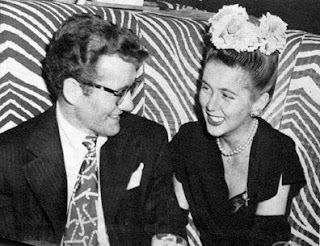 We were delighted that they invited us to their party and that we were able to attend it, and we had an absolutely marvelous time at it. One does so adore living the life in New York . 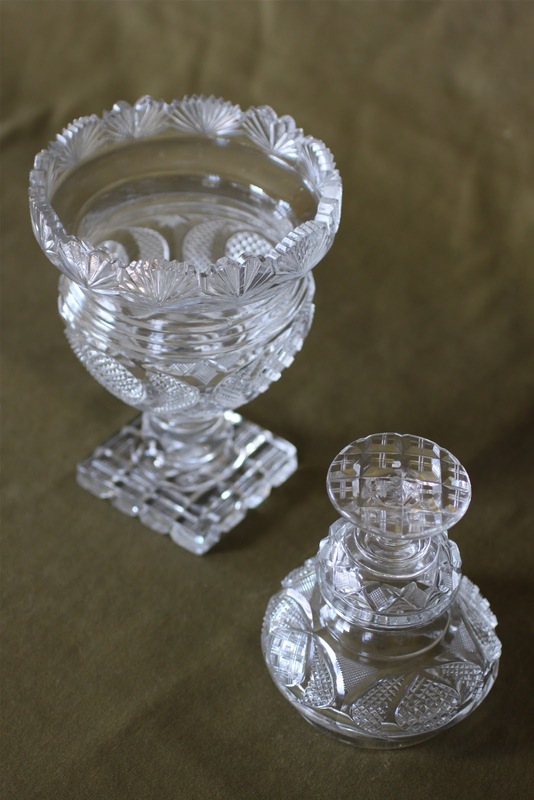 . .
One of the things that we collect at Darlington House is Anglo-Irish cut glass, concentrating on examples made during the first quarter of the nineteenth century, when the house was built. Initially we focused on buying articles for the table, such as salts. As our confidence grew and we became more knowledgeable we added vases and other vessels. Several years ago we splurged and bought a pair of fine Regency cut glass candlesticks hung with prisms. More recently, we've added a number of footed urns with covers, known as sweetmeats. When we bought the first of these vessels, the single one shown at the outset of this story, I wasn't exactly sure what sweetmeats were. I knew that it was an old-fashioned term for tasty little delicacies, but I didn't know of what sort. I wondered, were sweetmeats made with actual meat, like early mince-meat recipes? And if so, were they really sweetened? The thought of eating candied bits of meat served from these pretty glass containers was rather repulsive to me. Since then I've learned that the "meat" in sweetmeat is an old English word for "food," and that my forebears did not (as a rule) eat candied meat bits as a treat at the end of a meal. Whew! Sweetmeats are candied fruits and confectionaries, served both dry or suspended in syrups. The term is rather broadly encompassing of what constitutes a sweetmeat, but it usually does not include chocolates. 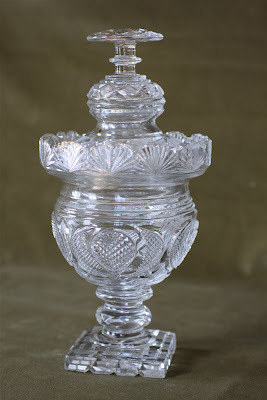 I believe the covered urns we have at Darlington House would most likely have held candied fruit in syrup. 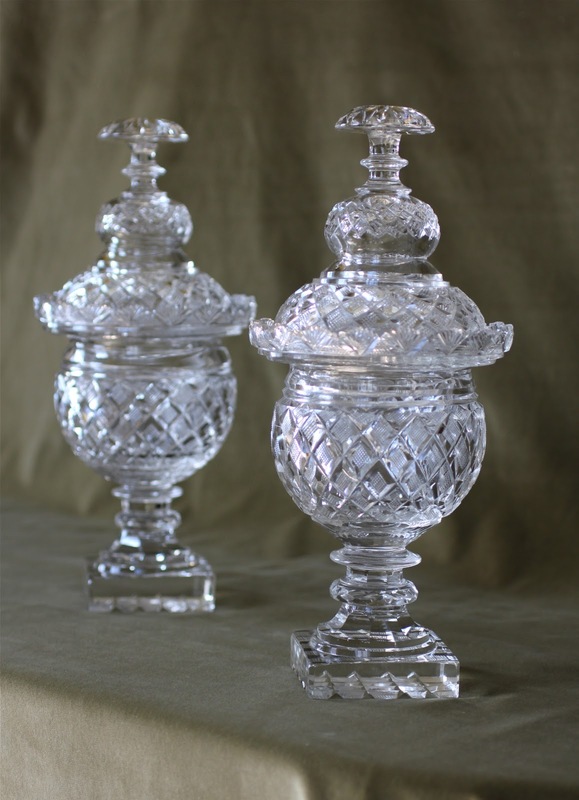 Put another way, they are Regency-era covered candy dishes. 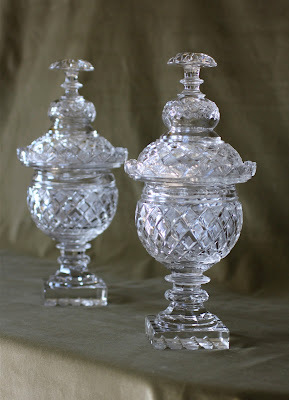 The urns lend a certain glittering drama to a room when displayed on a sideboard or table. They are fairly substantial in size, measuring between twelve and thirteen inches high with their covers on, and are quite dazzling when caught in the sun's rays. Have we ever used them for their original purpose, you might ask, to serve sweetmeats? No, not yet, but I am confident that we shall one day. I once suggested to Boy that we fill them with green and red M&Ms at Christmastime, as a joke. 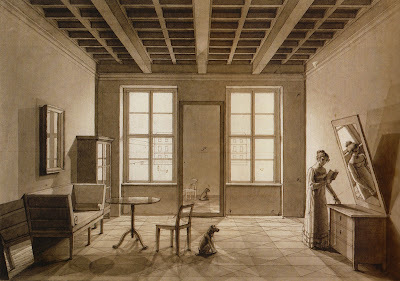 As some of my readers may remember, seven months ago to this very day I posted an essay titled The Perfect Covering for the Sought-After Chairs, Part I, in which I discussed my pleasure in finding a pair of New York City side chairs, circa 1800, for our drawing room at Darlington House. 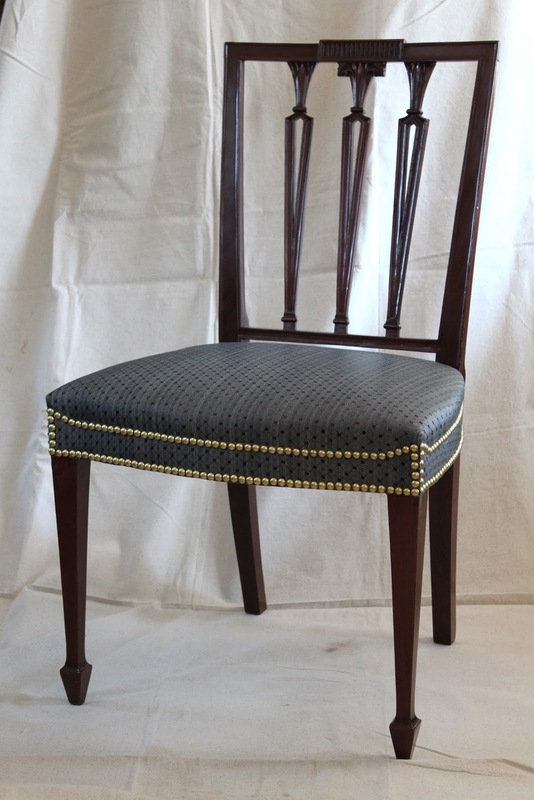 In the essay I described the process Boy and I went through in removing the rather pedestrian fabric that was on the chairs and our excitement in discovering the pattern of the original nailhead decoration on the frames. Well, as you can see from the photograph shown here, the chairs have now returned to Darlington House in their new slate colored haircloth (a term for material made with a horsehair weft through a cotton warp) upholstery, with the nailhead decoration restored to the original design. Boy had the chairs reupholstered at Baron, a to-the-trade upholsterer he uses in his interior decorating business. Baron did a superb, museum-quality job, and I am absolutely thrilled with how the chairs now look. 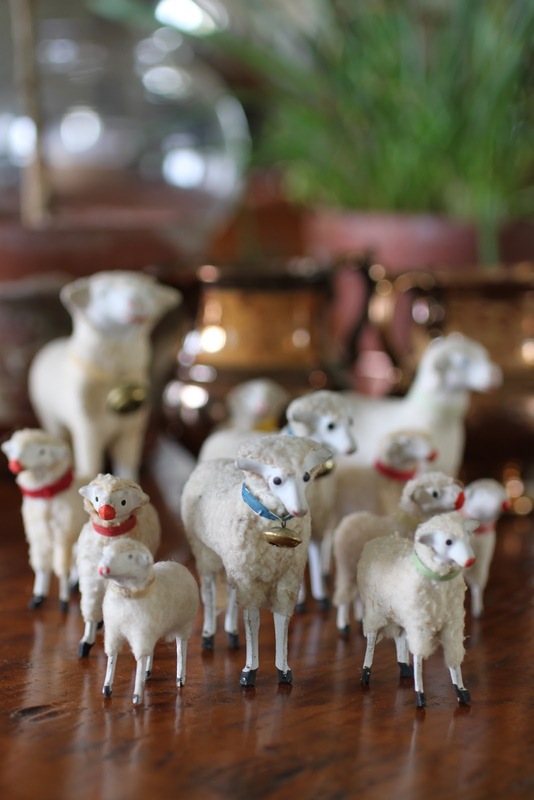 They are marvelous in our drawing room, too, where they fit in as if they have always been there—the hallmark of a truly successful addition to a room, in my view. Reggie is an advocate of using period-appropriate techniques and standards when reupholstering antique seating furniture, as we did with these chairs. That includes using horsehair stuffing and cotton batting for filling, rather than foam rubber or polyester, and attaching the materials to the frame with tacks instead of staples. While it is challenging to find upholsterers who are well versed in the correct proportions of period upholstery—much less willing to use the techniques and materials employed of old—it is most satisfying and pleasing when one does. Not only is the end product a thing of lasting beauty, but also it looks "right" and is respectful of the original intentions of the furniture's maker. And, in the case of these chairs, well worth the wait, too. Please forgive Reggie for dancing on air. He's had the most lovely of weeks . . . It started last Saturday with a house party at Darlington House, where we threw a knock-their-socks-off cocktail party that somehow, and much to my delight, turned into an impromptu, fun-beyond-belief dance party that went on until nearly four in the morning. 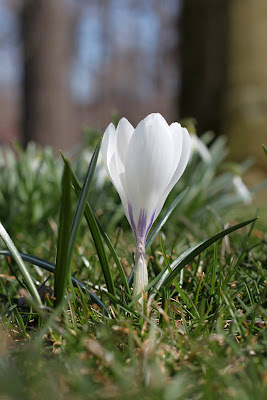 On Tuesday Reggie was thrilled to find himself honored to be a guest contributor on New York Social Diary, one of his absolutely most favorite, must-read blogs. On Thursday he was beside himself with pleasure to be quoted in a story in The New York Times by Christopher Petkanas on Emily Thompson, NewYork's newest florist with the mostest. And that very same evening he was thrilled beyond belief to arrive home at his city apartment to find a gift waiting for him of a most gorgeous bouquet of the most fabulous flowers from the guests of honor at our cocktail party, a lovely married couple. 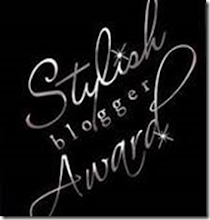 The wife is one of the most celebrated personages on the blogosphere, and Reggie is pleased as punch that both she and her husband have become dear friends. 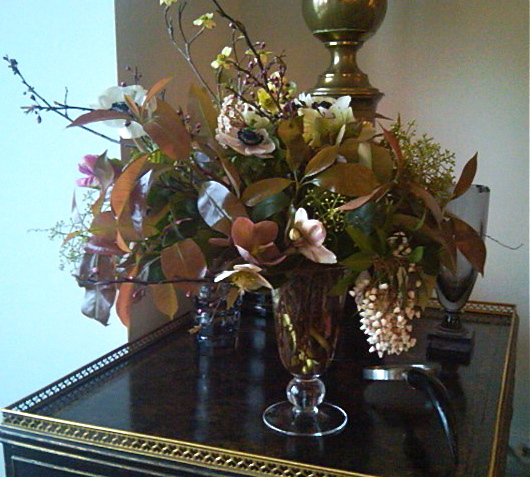 And on top of that, the flowers were from the atelier of Emily Thompson, the very same florist who was the subject of Christopher Petkanas' story in The New York Times! Reggie is convinced that it simply doesn't get any better than that. In fact, he just might faint!